Three days to go! Besides the afore mentioned weather another factor in the Roskilde experience is the food. 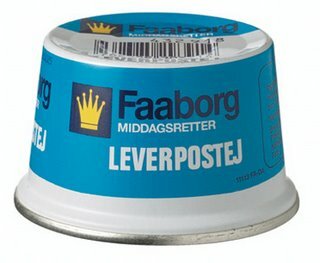 I think most people always start out figuring they can live on Faaborg (Pictured) ,a paté with no expiry date. (good tips for sprousing this baby up is plenty of salt and pepper and a lot of cucember) Two or three days in people normally give up this venture - it is simply not that good nor healthy for that matter. If you are willing to pay for it though, there is actually some really good food available at Roskilde, old favorites being the Louisiana Burger and the cheap Bruschetta. Another firm fixture on the cullenary table is a bowl of curry soup - These are exelent when its three in the night and you're still drunk trying to figure out how to carry on. So music time - Delightfully enough, Whomadewho are comming this year, though I have seen them twice I cannot get enough. It is definetly a concert worth seeing, highlights probably being funny costumes, Out the Door, and the performance of Satisfaction. Todays song is the b-side of the Space for Rent single( think). I don't know if I'm the only one hearing this every know and then, but to me Whomadewho have some weird touch of Pink Floyd to them? This is especially apparent on this track where you have the time to focus on the music and not just get caught up in good rythems.